You know how there's this stereotype on how you never look inside a lady's purse? Seriously, my dad won't even look in my mom's purse, and they've been married for 30 years. Well, I'm not one of those people. 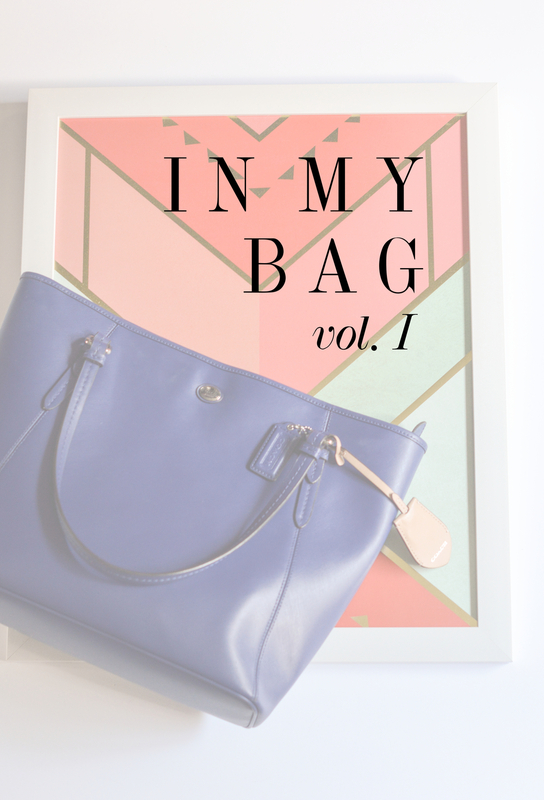 I've seen tons of posts covering what's inside some bloggers' bags and for me, it never gets old. I love the little tips and tricks that people have to keep their bag organized. I love learning some of the must haves people keep in their bags. I did this a couple of months ago about what I keep in my back pack, and now I'm going to share with you a little bit about what I keep in my bag! 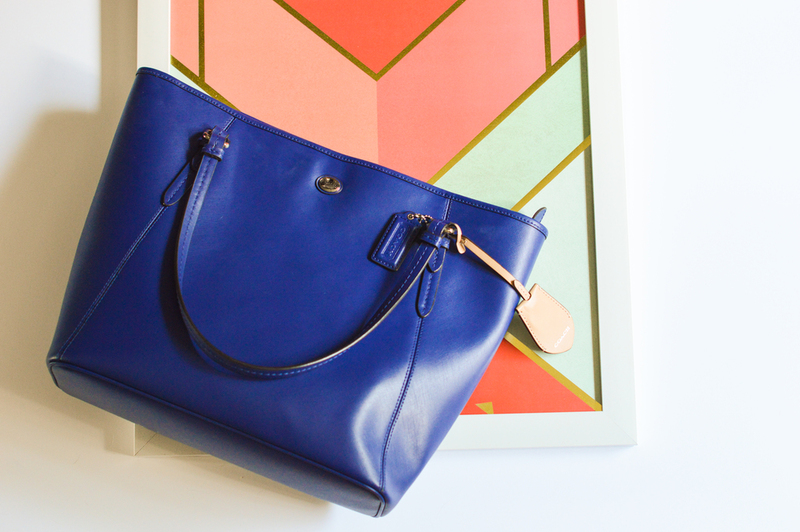 I'm currently carrying a tote from Coach Outlet in electric blue. One thing y'all gotta know about me is that when it comes to handbags, and clothing in general, is that if there isn't a sale, I'm not buying it. I managed to get this tote for 60% off the already discounted price… I payed around $120 for an amazing tote that's going to last for a long time! I've already had it for two years! 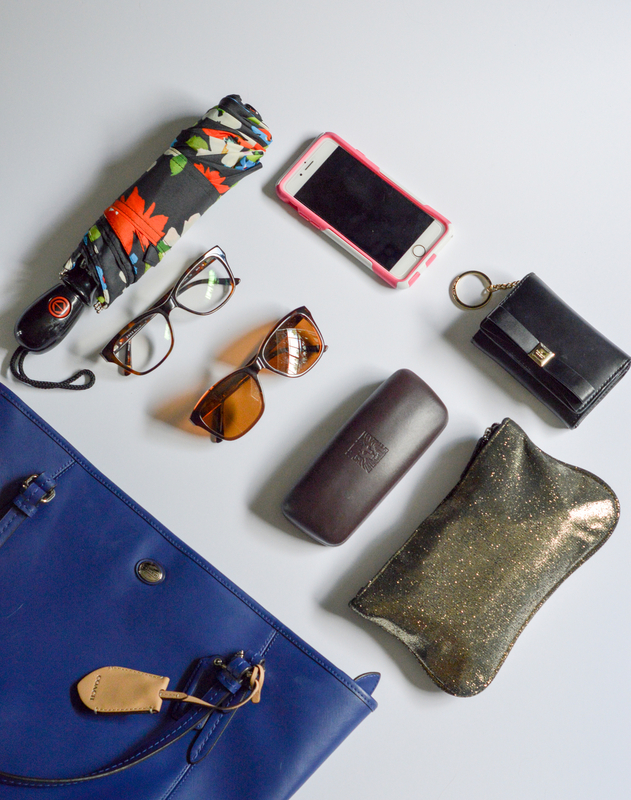 I have the usual… My wallet, glasses case, and sunglasses, but because of all this rain Houston is getting, I've been carrying my umbrella along with me. Also frequently included are my insulated cups for smoothies. I've been using Tervis cups on the regular (I like this one, this one and this one)! Another thing I carry around is my “Just in Case” bag! Inside my “Just in Case” bag, I have a Tide To Go Pen, Bandaid Friction Stick, Headphones, hand sanitizer, a compact mirror, Advil, a portable phone charger/speaker, and a wall charger for my iPhone. Not photographed: an embarrassing amount of gift cards, lady products, and deodorant. You can make your own decisions about that! My reasoning for carrying deodorant around is because Texas is hot, and it's always best to be prepared. In about 10 days I'm starting my summer internship, so added to this bag will be my bag of pens, pencils and highlighters, my computer or iPad (as I'm not sure which would fit the job better), and my Lilly Pulitzer agenda (because my Simplified Planner doesn't start until August)! All in all, I keep my tote pretty simple! If I don't need to be carrying it around, I don't carry it! 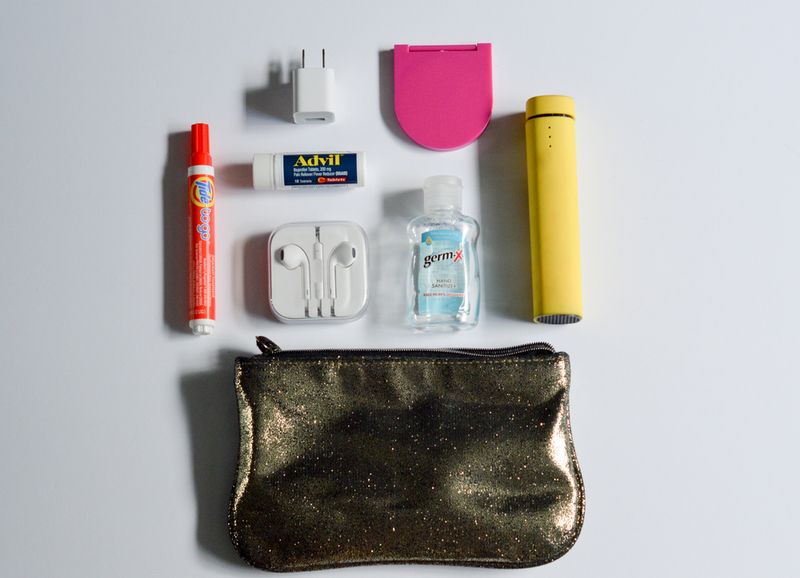 What are some things you keep in your handbag?